Leading experts discuss the characteristics, advantages, limitations and future aspects of modern spectroscopic techniques for environmental analysis. Demonstrates how these methods can be applied to trace gas detection and assessment. Concentrates on the latest techniques--both laser and non-laser based--which offer advantages for air pollution and gas monitoring as opposed to more conventional methods. Numerous examples of applications illustrate the potential of the techniques backed up by cutting-edge information and representative data. 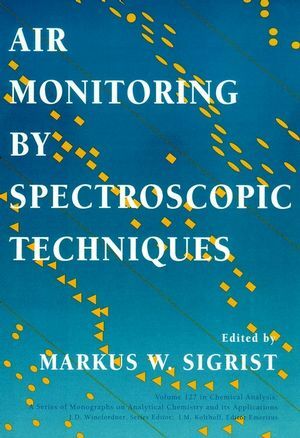 Markus W. Sigrist and James D. Winefordner are the authors of Air Monitoring by Spectroscopic Techniques, published by Wiley. Introduction to Environmental Sensing (M. Sigrist). Differential Optical Absorption Spectroscopy (DOAS) (U.Platt). Differential Absorption Lidar (DIAL) (S. Svanberg). Air Monitoring by Laser Photoacoustic Spectroscopy (M.Sigrist). The Use of Tunable Diode Laser Absorption Spectroscopy forAtmospheric Measurements (H. Schiff, et al.). Gas Measurement in the Fundamental Infrared Region (P. Hanst &S. Hanst). Matrix Isolation Spectroscopy in Atmospheric Chemistry (D.Griffith).